LIMA — He’s the Wayne Gretzky or the LeBron James of drag racing. 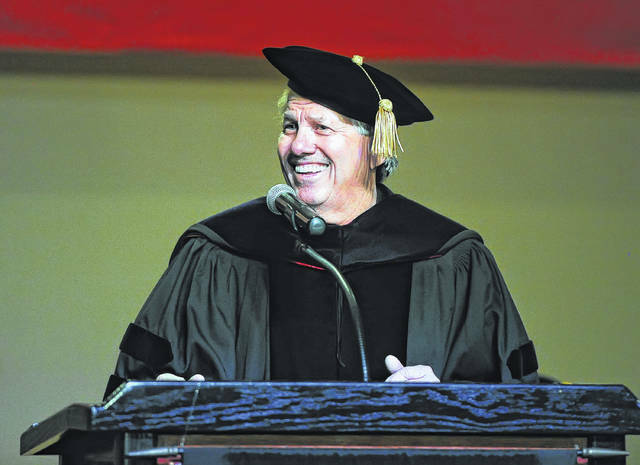 John Force may not be a household name, but the legendary racer is very familiar to those in the racing business and to students at the University of Northwestern Ohio. UNOH President Jeffrey A. Jarvis presented Force with an honorary Doctor of Laws degree at a special ceremony at the UNOH Event Center, Wednesday. He was joined by current students, faculty, staff and special guests. “I’ve met him a few times before but to be able to shake his hand again now and talk to him a little bit more it’s going to be pretty cool,” said Anastasios Kaidirmaoglou Jr., a High Performance Engineering student at UNOH. Force is best known for his 16 Funny Car championships and 148 NHRA victories. Force’s first championship came in 1990, and he went on an incredible run of 10 consecutive titles from 1993-2002. His most recent championship as a driver came in 2013. In 2017, his teams took home the Top Fuel and Funny Car championships, earning Force his 19th and 20th championships as a car owner. His legacy continues to live on through the next generation of John Force Racing drivers including daughters Courtney and Brittany and son-in-law Robert Hight.